His painting 1949-A-No 1, with its white splashes over red and white, smashed his previous record of $21.3m (£13.4m), for 1947-R-No 1, set in 2006. The reclusive artist died in 1980. A sale total - with commissions - of $315.8m (£198.5m), including an artist record of $20.8m (£13.1m) for Gerhard Richter abstract (849-3), capped a strong week for New York sales. Another Clyfford Still painting, 1947-Y-No 2 - which had a pre-sale estimate of up to $20m (£12.6m) - sold for $31.4m (£19.7m). The artist's record-breaking 1949-A-No 1 carried a pre-sale estimate of $35m (£22m). 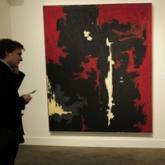 Four pieces by Still, whose works rarely come to market, were sold, taking a total of $114m (£71.6m). All of the works came from the Estate of Patricia Still and were being sold by the City and County of Denver with funds going towards the new Clyfford Still Museum, set to open in a week's time. A group of eight works by German artist Richter fetched a total of $74m (£46.5m); Francis Bacon's Three Studies for a Self-Portrait sold for $19.7m (£12.4m). Auctioneer Tobias Meyer said the overall total - the auction house's highest for a contemporary sale since May 2008 - "blew every expectation away". On Tuesday, a painting by pop artist Roy Lichtenstein sold at Christie's New York for a record $43m (£27m) which helped the auction house to a sale total of $247.6m (£155.5m).